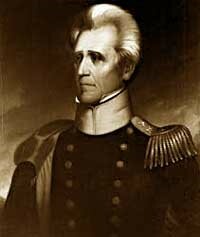 The presidential election of 1828 brought a great victory for ANDREW JACKSON. Not only did he get almost 70 percent of the votes cast in the electoral college, popular participation in the election soared to an unheard of 60 percent. This more than doubled the turnout in 1824; Jackson clearly headed a sweeping political movement.